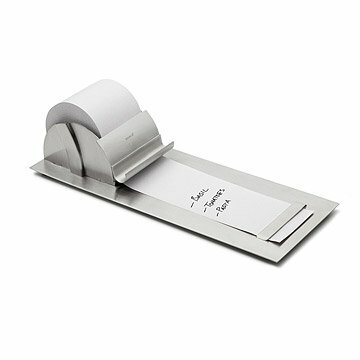 This contemporary memo pad dispenses note paper of any length from a replaceable roll. Feel like your to-do list is getting out of control? Then this handy list dispenser will have you on a roll. The contemporary styling of its design makes it an attractive accessory on your desk or countertop. You can even hang it on the wall to keep it conveniently close to your refrigerator or front door. Whether you're making a daily check-list, jotting down your needed groceries, or writing notes for family members, the easily refillable roll offers you just the right size of paper. Made in China. It's displayed right on my kitchen counter, firmly in place, matching my stainless steel kitchen, a place for my pen/pencil and right there for me to write lists, reminders...whatever. I love it! This is the second time Imvought this product. Love It! So easy to use, compact, works extremely well. I have it sitting on my kitchen counter. It looks sleek and modern. Better than having a notepad. What a treat to get such a nicely made and engineered product. It works exactly as I had hoped. The included roll of paper was a plus and the instruction sheet was well written. Love the look... Was setting up a new office and wanted something to take quick notes on. My mom loves hers, it's easy to use and is very handy!